Hazel is a Screen Gems television series about a fictional live-in maid named Hazel Burke (Shirley Booth) and her employers, the Baxters. The five-season, 154-episode series aired in primetime from September 1961 until April 1966. The first four seasons aired on NBC, were sponsored by Ford Motor Company, which had earlier underwritten Tennessee Ernie Ford‘s comedy and variety show, The Ford Show. During season four, Bristol-Myers co-sponsored Hazel. In the final season on CBS, Procter & Gamble and Philip Morris were the sponsors. The show was based on a popular single panel comic strip by cartoonist Ted Key that appeared in the Saturday Evening Post. Hazel is a competent, take-charge, live-in maid in the home of George Baxter, a partner in the law firm of Butterworth, Hatch, Noll & Baxter, and known as “Mr. B” to Hazel (Don DeFore), his interior decorator wife Dorothy, whom Hazel calls “Missy” (Whitney Blake), their schoolboy son Harold, known by Hazel as “Sport” (Bobby Buntrock), and the family dog Smiley. Hazel had worked with Dorothy’s family before, so she knew her best. The series humorously dramatizes Hazel’s life with the Baxters and her friendships with others in the neighborhood such as postman Barney Hatfield (Robert Williams), taxi-driving Mitch Brady (Dub Taylor), and Rosie Hammaker (Maudie Prickett), another maid in the area. Johnny Washbrook, formerly of My Friend Flicka, guest starred as Hazel’s nephew, Eddie Burke. Many episodes focus on the perennial contest of wills between Hazel and her boss over issues around the house; “Mr. B” usually concedes defeat and grants Hazel’s wishes when she tortures him by serving meager portions of her mouth-watering desserts. Some episodes take Hazel outside the Baxter house and follow her life in the community. In the first episode, for example, she spearheads a drive for the construction of a neighborhood playground. Hazel’s life is sometimes complicated by George’s snobby Boston sister Deirdre Thompson (Cathy Lewis) and his gruff client Harvey Griffin (Howard Smith). Dotty neighbors Herbert and Harriet Johnson (Donald Foster and Norma Varden) often call upon Hazel’s expertise in household matters. 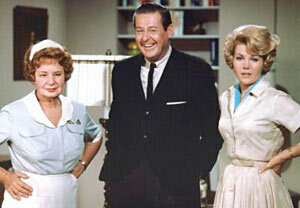 In the show’s final season, on CBS, George and Dorothy depart for the Middle East in conjunction with George’s work (DeFore and Blake were dropped from the cast) while Harold and Hazel move in with George’s younger brother, Steve (Ray Fulmer), a real estate agent, Steve’s wife Barbara (Lynn Borden), and their daughter Susie (Julia Benjamin). Hazel provides housekeeping services for her revamped family. The new Baxters reflected a desire for younger demographics. (CBS said that Ms. Blake was not available after NBC’s cancellation, although Don DeFore noted that he found out about the change while reading the newspaper.) The most notable new arrival was the teenage actress who played Millie Ballard, Steve Baxter’s receptionist. Ann Jillian went on to star in her own series, It’s a Living, and numerous television movies. In episode 45 of This American Life, Act 4, “Lifestyles of the Rich and Famous”, Cheryl Trykv tells the story of getting lost as a teenager riding a bike (in only a swimsuit) around Palm Springs on a baking hot day. She gets so dehydrated she knocks on strangers’ doors (rather than listen to the lawn-elves she hears telling her to drink her pee) until Shirley Booth answers, invites her in and lets her use the bathroom. Over lemon water they chat about New York City and American Theatre. Shirley tells Cheryl that she hadn’t heard rumours about Joan Crawford and Lucille Ball being lesbian lovers but that once at a party thrown by then-California Governor Ronald Reagan, Ball had drunkenly thrown a grape down Shirley’s bosom.